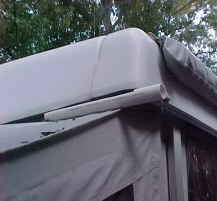 Gutters For Your Pop Up !!
" That darn thing works !!" 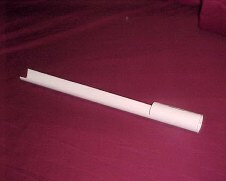 take a jig saw and saw half way tru the pipe about 6 inches from the end. pipe up to your first cut. Sand the edges and you are finished. be notice in the camper ! even in a driving rain storm and 35 MPH winds it stayed in place. it work and let me know how you like it! Happy Camping Everyone !! 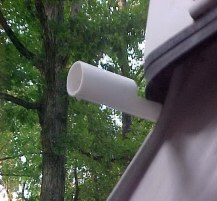 This is what your gutter should look like after you finish cutting it. This picture shows the gutter in place and working !! You can even see the water dripping !